Penn State University Press, 9780271082127, 384pp. A manual for constructing talismans, mixing magical compounds, summoning planetary spirits, and determining astrological conditions, Picatrix is a cornerstone of Western esotericism. It offers important insights not only into occult practices and beliefs but also into the transmission of magical ideas from antiquity to the present. Dan Attrell and David Porreca's English translation opens the world of this vital medieval treatise to modern-day scholars and lay readers. The original text, Ghāyat al-Ḥakīm, was compiled in Arabic from over two hundred sources in the latter half of the tenth century. It was translated into Castilian Spanish in the mid-thirteenth century, and shortly thereafter into Latin. Based on David Pingree's edition of the Latin text, this translation captures the spirit of Picatrix's role in the European tradition. In the world of Picatrix, we see a seamless integration of practical magic, earnest piety, and traditional philosophy. The detailed introduction considers the text's reception through multiple iterations and includes an enlightening statistical breakdown of the rituals described in the book. 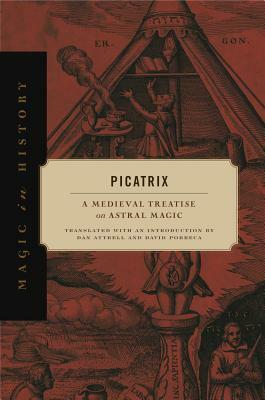 Framed by extensive research on the ancient and medieval context that gave rise to the Latin version of the text, this translation of Picatrix will be an indispensable volume for students and scholars of the history of science, magic, and religion and will fascinate anyone interested in the occult.